Today was the first day I noticed the wild cherries blooming along the river. 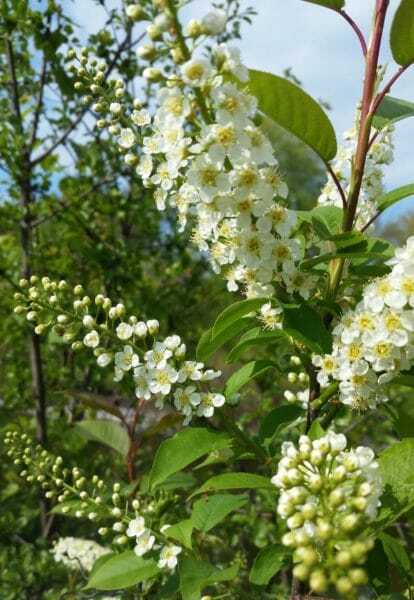 I usually call these chokecherries, but Wikipedia tells me that birdcherry and hackberry are more common names for this particular species, which appears to be Prunus padus by the shape of the flower racemes, while chokecherry is used more often for Prunus virginiana. Prunus virginiana is native to North America; Prunus padus is from Eurasia. Besides, I could never call Prunus padus “hackberry.” I already put that name in use for an entirely different sort of tree that we have a lot of around here, Celtis occidentalis, that also has small, edible fruits. Ah, well. 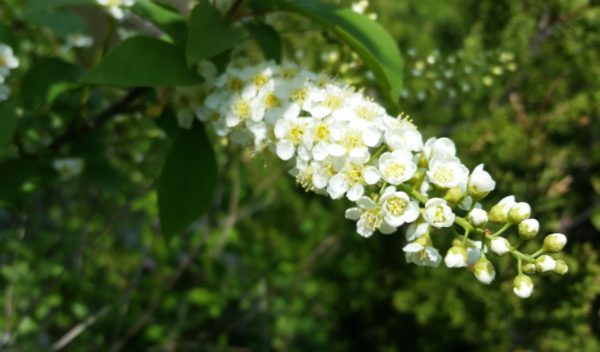 When it comes to eating the pea-sized fruits, Prunus padus and Prunus virginiana are both alike: bitter and astringent when eaten fresh, but sweet and wonderfully flavored when cooked. In late summer, I love picking them for juices, jellies and sauces, if I can get to them before the birds do. The picking can be a bit tedious given that the berries are so small. But if I listen to a good, long audiobook—Bleak House by Charles Dickens is a good pick—I could pick all day.